At Scott Temperature, we recognize the need for giving back to the community. Whether lending a helping hand or providing equipment for those in need, we are proud to help those who offer services where there otherwise wouldn’t be any. As a locally-owned family business for 70 years, we have a public responsibility to give back to the community where and how we can. From the home building job sites with Habitat for Humanity to the youth classrooms with Junior Achievement, we are proud to help those that are so willing to help others. Tenants to Homeowners, Boys & Girls Club, O’Connell Youth Ranch, Theatre Lawrence and Ballard Center, and Health Care Access are also among the many non-profits we help. 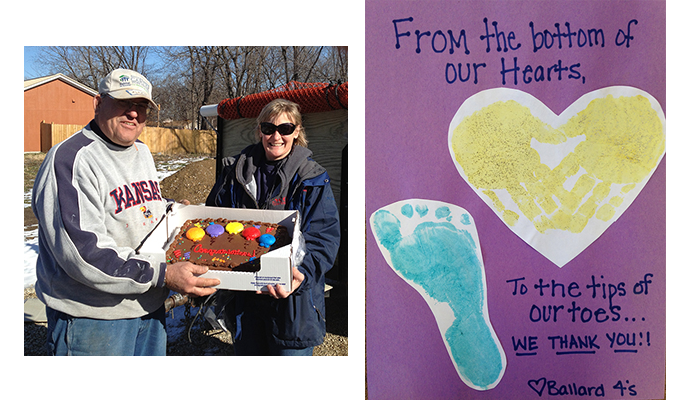 Here is a picture from the Habitat for Humanity of the construction manager’s retirement celebration at a home building job site along with a thank you note from Ballard Center for helping with their most recent B3 fundraising event.